Futures are up slightly with the /ES near the 910 level. Bonds are lower and the dollar is about even. 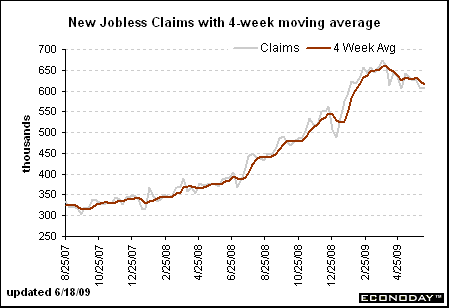 And in Economic news, Jobless Claims remained stubbornly above 600k, coming in at 608,000, up from 601,000 last week (which was revised upward to 605k). Interestingly continuing claims fell for the first time in a very long time… Still, at 6.687 million, it’s in an area that simply cannot be called good (although the greenshoot crowd will try). My take? I think this crisis has been going on for so long now than some of the people who lost work over a year ago are now falling off the roles. Jobs are not being created to hire them off the roles. Leading indicators and the Philly Fed Survey come out at 10 Eastern. Tomorrow is Quadruple witching and there are no meaningful reports tomorrow, but there are several bond auctions. The S&P reached the 200dma yesterday and failed to close underneath. The 50dma is just beneath 900 and rising. The DOW is in between the 50 and 200, while the Transports pinned the 50dma yesterday and closed just above it. So this is an area of support and with the short term stochastics oversold would not be surprised by a meaningful retrace of the selling at some point soon. That said, if we slip beneath those moving averages, the outlook will get more bearish in a hurry. The XLF, by the way, pinned the 50dma and the lower Bollinger Band before closing just above it. Yesterday’s down, up, down, action produced a small change in the McClelland Oscillator. Thus we can expect a large price movement most likely today or tomorrow, direction unknown from that indicator. Again, the short term oscillators favor upside here, but I am definitely bearish with the economic data that’s been coming out. I think a lot of people are expecting the lows to not be tested and that we’ll just have a shallow pullback and then go roaring higher again. I’m not so sure of that, although I am cognizant of the fact that summer time does not favor the crash like scenario. Long term bonds did find support by bouncing off that long term TLT uptrend line as I suggested was likely. I keep reading where a lot of people believe that bonds are going to go all the way back to where they were or even lower in terms of interest rates. I DON’T THINK SO. The long bonds experienced a parabolic blow off top and collapsed… bubbles do not reflate once revulsion has occurred. The reason is that blow off tops need outsiders to create the bubble… once the bubble pops the outsiders are the ones who get burned and they do not come back. Thus Bernanke has a problem. When, not if, equities tank again, you will not (I believe) see interest rates get all the way back down to where they were. That’s why I believe that instead of seeing equities go down hard with money flowing into bonds, the next round may see equities go down, bonds stay in a range, and money flee the United States sending the dollar lower or keeping it in a range instead of stengthening as much as the last bout of deleveraging. We’ll see, but that would be my guess, it won’t be pretty regardless. Will the DOW Reach 30,000 by 2015?